CodeRed will notify you in the event of an emergency situation or critical community alert through a phone call, text message, email, or mobile app notification. Examples include: severe weather, natural disasters, evacuation notices, power outages, boil water notices, missing persons, and any other potentially dangerous or hazardous situations. 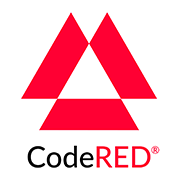 Register for CodeRed online by creating an account here. Once registered, download the CodeRed mobile app to have alerts sent directly to your mobile device. The app is available for download on any Apple or Android device.